Sold out to the max! Next time. Go to Workshop Info NOW! John Marshall performs on concert stages, radio, television, and film both nationally and internationally. He includes the drumming traditions of the Middle East, North and South India, Egypt, West Africa, the Caribbean, and Central Asia in his repertoire. Performing on frame drums, tabla, doumbek, tombak, djembe, congas, riq, pandiero, mbira, conventional Western percussion, and all manner of hand-held percussion, John Marshall's music has been featured on National Public Radio's All Things Considered, Echoes, Hearts Of Space, PBS Television and the British Broadcasting Company (BBC). He has performed and recorded with such artists as The Paul Winter Consort, Michael Brecker, Glen Velez, Rhonda Larson, Danny Gottlieb, Harvie Swartz, Robert Gass, Steve Gorn, Omar Faruk Tekbilek, Snatam Kaur, Paco Pena, Krishna Das, David Darling, Eugene Freison, Benjamin Verdery, Coleman Barks, Yevgeny Yevtushenko, George Benson and Marc Anthony. Performances include Centro y Exposiciones in the Dominican Republic, The New Jersey Chamber Music Society, Taos Chamber Music Group, Norfolk Chamber Music Festival, Tidewater Guitar Festival, Sacred Music Festival, Paradise Island, Bahamas, Virginia Arts Festival, Honolulu Performing Arts Series, Maui Concert Series, Yale Guitar Extravaganza, Music Mountain, Paul Halley's Soulstice Celebration, Chorus Angelicus, New Haven Festival of Arts and Ideas, Hartford Jazz Festival, Town Hall, Merkin Concert Hall, Alice Tully Hall at Lincoln Center, The Cathedral of Saint John the Divine, and the United Nations. With numerous CD credits to his name, John is recorded on DMP, Ellipsis Arts, Sony, Jazzheads, Spring Hill, Windham Hill and Virgin record labels. The recipient of several awards, he has been recognized for excellence in percussion music education by the Pro-Mark Drum Corporation. In 2009, John was awarded national fellowship by the Jubilation Foundation and Tides Corporation. In 2004 he was commissioned to compose original music for the ASAP Community dance project in collaboration with Pilobolus Dance Theatre. Active in scoring original music for films and documentaries, John Marshall's music has appeared in award winning films released both nationally and internationally. Marshall's instructional books and CDs, Hand Drums for Beginners (5 star rating), World Beat Encyclopedia, and Drum Atlas:Africa are available everywhere through Alfred Publishing. Sponsored by the Cooperman Drum Company , Precision Drum Company and Claydrum Udus, and Hamid Alwan Arabic Percussion, John tours the country with his adult seminar and Workshop Series ,performs through Young Audiences of America, Armstrong Chamber Enrichment Series, ASAP After School Arts Program, Arts Magnet School Systems, Hartford Intercity Arts Outreach, and during the summer of 2004, was Percussion Instructor in Residence at the Punahou School in Hawaii. He performs with the classical/jazz/world ensemble Ufonia, composes for and performs with numerous percussion groups, including Framework, and WoMaDe, and is much sought after in the freelance arena. He has released his own CDs featuring his original compositions, and is at work on creating online hand percussion instruction for Warner Brothers/Alfred. Currently, John enjoys performing with the experimental improvisational trio Bridges and Poems, which includes composer/guitarist Robert Weinstein and woodwind player Paul Butler. Additionally, he is studying traditional composition/performance technique of North Indian Tabla with Subhankar Banerjee and Narendra Budhakar. John holds degrees from New York University in religious literature and did his graduate work at Weslyan University in Ethnomusicology where his principal teachers were Royal Hartigan and Abraham Adzenyah. John further studied at the Mannes School in New York, and the Manhattan School of Music where he was taught by Paul Price, Norman Grossman, Glen Velez and Elvin Jones. The father of three, grandfather of one, John resides in Northern Connecticut with his wife, artist Cecilia Marshall. 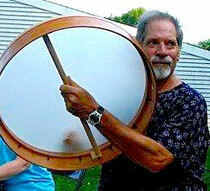 Get more INFO on the Frame Drumming Workshops on April 27th! John Marshall specializes in the Frame Drum, a small or large single headed drum with or without jingles, played with a variety of sophisticated finger techniques found around the world.